EXETER’S Met Office has defended its work in the face of fierce criticism at Westminster amid claims it has been “hijacked by the climate change lobby”. The defence came after one outspoken MP branded the “serial inaccuracy” of the agency’s forecasts a “scandal”. But the forecaster has pointed out its five-day weather predictions were being used to help deal with the prolonged freeze. And its day-to-day forecasts were “very accurate”. And despite the current cold snap, there was no doubt that man had contributed to climate change. It comes after veteran Tory MP Nicholas Winterton launched a concerted attack on the Met Office in the Commons. Click source to read FULL report and many thanks to Tory MP Nicholas Winterton, please can we have more of the same. The current cold spell affecting most of the northern hemisphere is causing quite a stir with widespread scientific and media attention and confusion. The proponents of human caused climate change seem to be in a panic and most sceptics carry a smirk. However it all fits in very nicely with the forecast that I issued last August concerning the coming winter. The full prediction (Winter2009/2010 for UK) can be found in my section of the climaterealists.com forum. AS Britain’s winter of discontent threatened a fresh wave of blizzards and freezing temperatures last night, Gordon Brown stood accused of failing to protect the nation. With up to 60,000 deaths predicted because of the relentless cold and the country’s major roads facing a gritting crisis, Downing Street was heavily criticised for the widespread chaos. Conservative leader David Cameron slammed the lack of leadership at Number 10 – as the Prime Minister all but ignored the national crisis in a battle for his own political survival. Mr Cameron said: “At times like these the country needs strong and united leadership. “We can’t go on with a Government that is more focused on its internal problems than trying to help people through difficult times, including some of the worst weather conditions the UK has experienced for years.” The Prime Minister last night admitted that for many people this was a “very serious, worrying and frustrating time”. Never mind the failed putsch against Gordon Brown and England’s Test match heroics, the matter of the moment is the white stuff. We haven’t had snow all over the country like this for decades. What’s changed and why? The first part — what’s changed — is relatively straightforward: a freezing draught has started coming in through the UK’s door from the North Pole and Siberia. The block has forced our typical weather south: our rain has instead been falling in Spain, which is having an unusually wet winter. “They’ve had the rain and instead we’ve had winds either from the Arctic or from Siberia via Scandinavia,” said Thwaites. The Royal Society for the Protection of Birds (RSPB) is organising emergency feeding of several threatened species, including bitterns and cirl buntings. The RSPB is also asking people to feed garden birds, which are struggling to find food in the freezing weather. The harsh winter could hit bird numbers "for many years to come", they warn. The UK's Met Office recorded the winter's coldest day on Friday, when temperatures plunged to -22.3C (-8.1F) in Scotland's Highlands. If you think I am making this up, I cannot honestly blame you. I can only invite you to go to BBC iPlayer and view Newsnight for 7 January, in order to hear this garbage for yourself. So, the prediction of a mild winter “wasn’t actually wrong”. Does the term “in denial” have any more graphic illustration than that? If you look out the window you might get the impression of Arctic conditions. But please remember, that is only an impression – a wrong impression. In scientific terms, it is baking hot. 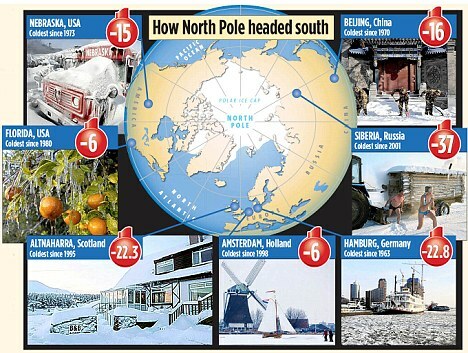 Deep freeze Britain was as cold as the South Pole as temperatures plummeted to a staggering minus 21c. Amid increasing fears of an energy crisis, the country is locked in the biggest chill for nearly 30 years. The mercury sank to minus 21.2C (minus 6.2F) in parts of the Scottish Highlands - considerably colder than some home freezers - with bitterly cold temperatures everywhere else on another day of widespread weather disruption. Icy conditions have again left roads in a treacherous state and caused delays and cancellations for rail and air passengers. Hundreds of schools have also shut again today, resulting in a full week of closure for some children. Last night forecasters gave a grim warning of worse to come, with strong winds blowing in to add wind chill to already below-zero temperatures which could continue for at least ten more days. The prediction came as the worst cold spell since the winter of 1981-82 continued to cause chaos. And when the bad weather finally hit last month, Government guidance to councils on how much salt they should have in stock – six days’ worth – was woefully inadequate given that the UK is experiencing one of the worst winters in 100 years. A report for the Government completed in July and published in early August made 19 recommendations on what preparations should be made to ensure Britain’s roads kept moving in the event of a severe winter. The UK Roads Liaison Group, drawn from national and local government, had been asked to report on the lessons of last winter’s long cold snap which culminated in February in serious problems and saw many salt supplies almost exhausted.